I chose Burlap, Sparkle, and Birds of a Feather for my tic-tac-toe, and I went pretty literal with the sketch, too! I started with the lacy background from Touches of Texture, stamping on my notecard in Pool Party, then I stamped and cut out the feathers from What the Doodle: Feather (Papertrey) in Pacific Point. I put a strip of Sticky Strip across the card, adhered a strip of burlap, then sprinkled Dazzling Diamonds glitter on top. Unfortunately, you cannot see the sparkle here in the photo, but it is very cool IRL! I added a sentiment (Our Daily Bread Designs Mini Tags), and popped up the feathers with a dimensional. My last embellishments were a little diecut bird (Poppystamps Chirping Birds), a little linen thread bow, and a single sequin! Thanks for stopping by! Cassidy is helping me make zucchini bread...for some reason this year, we have a PLETHORA of zucchini! More than any other year! And you can see zucchini pancakes cooling in the background! Hence the lack of stamping time! and from another sweet, loooong-time friend, Billie! I just love the country feel of this card! I love your blue feathers with the sweet bird~! The burlap looks terrific - I need to use that more! So glad you joined us and made my sketch look fabulous! Oh my, I love that card! 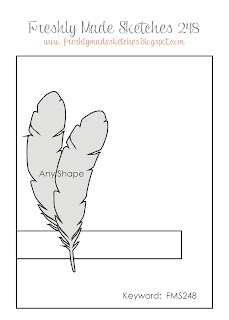 That's a gorgeous feather stamp, and I love the color you chose. Enjoy that zucchini. Can't believe it's August already. Wow LeAnne, your rocked both challenges, this is fantastic!! Love the texture and your cute feathers. Speaking of cute, Cassidy looks adorable with her braids!! Wow your cards are lovely! I love the design of your first, and great incorporation of burlap! Thanks so much for joining us at Tic Tac Toe Challenge!! Beautiful card! I love the texture you added! Oh, I love those blues! And the organic touch with the burlap is fabulous. Such a pretty card, LeAnne! I haven't had zucchini bread in years -- yum!! Oooh, I love those feathers. And the sweet little birdie is a nice touch! Beautiful card, love that stamp set you used. Patertrey bring out the most amazing stamps and dies. Also love the colours you used, it works perfectly.